With Thanksgiving right around the corner, I thought it was time to start playing with some ideas for the holidays. I’ve posted brussels sprouts recipes before because they are one of my favorite fall vegetables. They take on salty or sweet flavors with ease and are a great platform for a filling and flavorful vegetable. I made this recipe this past week, a sweeter version, and found that my family and mom’s friend Kathy really loved it! Both families are making it for Thanksgiving next week, and I hope you try it soon. What are your favorite recipes for Thanksgiving? Any unusual family traditions? Lay the brussels sprouts in an even layer on a cookie sheet. Drizzle with about 1 tbs olive oil and season well with salt and pepper. Lay back into one layer and bake in the oven for 25-30 minutes, or until the sprouts are browned and tender. Flip on the cookie sheet every 15 minutes or so while they bake for even cooking. While the sprouts are cooking, heat a medium saute pan with a dash of oil. Cook the apples and leek on medium heat for about 6 minutes, or until they start to caramelize. Remove from the heat. 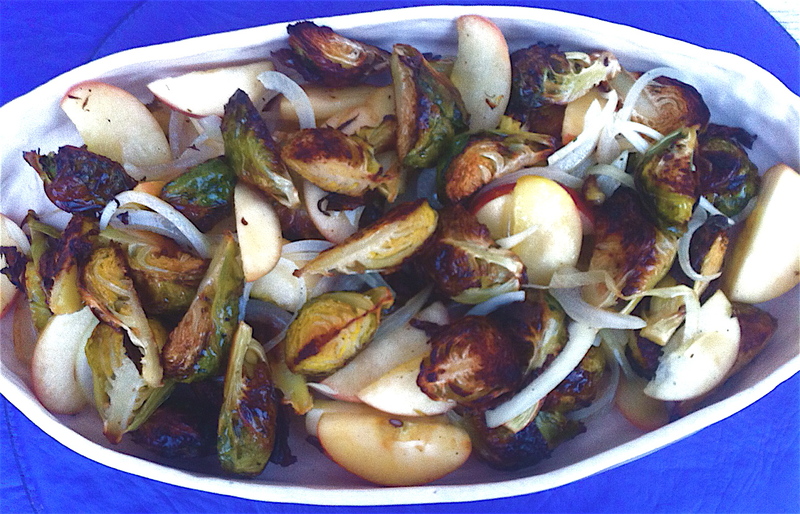 When the sprouts are removed from the oven, toss with the apples and leeks. To make the dressing, whisk together all of the ingredients, the oil last, to make a vinaigrette. Season with salt and pepper. The dressing can be made ahead of time. Toss the dressing with the apples and sprouts; serve warm.